With the start of the school year, backpacks will be filled with notes home to parents. Instead of the expected warnings about forgotten PE kits last year, though, one mother discovered a flyer from her child’s school exhorting parents to tell their kids to ‘PUT DOWN THAT TABLET!’ Concerned about the negative tone, and lack of balance, mum and researcher ‘Beth’ (who wants to remain anonymous) wrote a detailed response to the school. This post recounts Beth’s exchange with the school, and why she felt she had to respond. It illustrates why schools need to give evidence-based advice to parents, rather than simply telling them to ‘turn it off’. Something about literature shouting at me like a 1940s propaganda poster makes me feel like a naughty child – this is not a good start. OK, I thought, maybe they’ve got their reasons. Let’s take a look. The flyer went on to say that tablets were ‘dangerous’ – and that an arbitrary amount of time spent on them was the difference between ‘enough’ and ‘too much’. 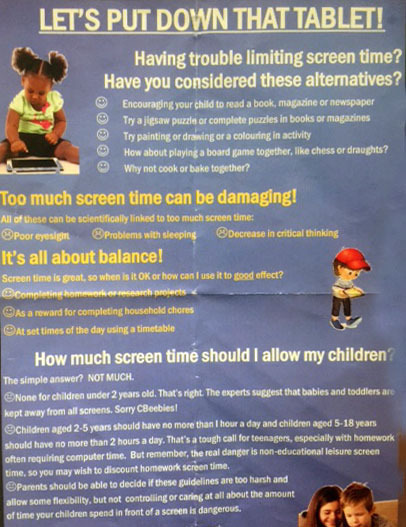 The alarmist portrayal of tablet usage as a damaging indulgence reminded me of a poster warning people about junk food – but surely it’s possible to create a balanced technology diet? What I was reading did not align with my own experiences as a mother of a two-year-old, who seemed to be getting huge learning value from a carefully monitored iPad. I started researching the issue, and wrote a response. Thankfully, the school welcomed my feedback, and invited me in to talk to them about it. Interactive: The child should be required to do something, otherwise they may just as well be watching TV; interaction means they will be engaged in what they are doing and learning from it. Complementary: A link to current school subjects, hobby or a day’s activity. Repetition and variation will support learning. Variety: Learning happens every day in a variety of ways, both direct and indirect. Children benefit from variety and making choices. Interactive screens are part of the variety. Moderation: Don’t let it be the only way they learn. Too much of any single thing can be detrimental. Keep mixing it up. 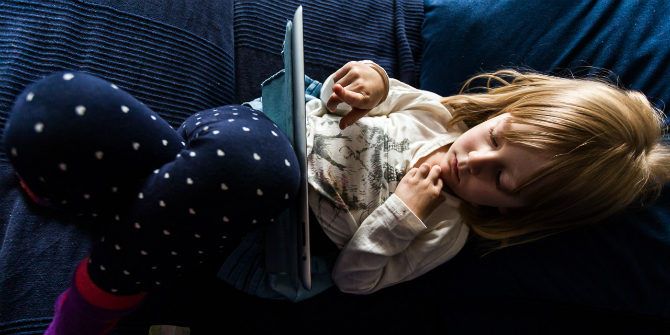 Age-appropriate: Just as we consider the appropriateness of the films our children watch, the same consideration needs to be given to the content they consume on a tablet. This helped me define and formalise a process I had been doing in my head – hunting for apps and activities I thought would benefit my child while avoiding things that might be harmful, and restricting access to those that were basically vacuous (see also recommendations from the Joan Ganz Cooney Center and Common Sense Media). To my surprise, the school agreed with a lot of what my letter said, but assured me that they had good reasons for taking their approach. Desperate parents had been asking the school for help, in one extreme case crying in the Head’s office because their child was utterly obsessed with their tablet, resulting in full-blown tantrums if it was removed. With no official guidance available, the school were drawing on out-of-date research from a questionable source, playing it simple and safe. This felt like such a lost opportunity – a blown chance for the school to say something positive about the learning potential. What about approving certain apps that have been found to help development and that align with the school curriculum? Where’s the specific advice to avoid ‘junk food’ apps like Angry Birds or Candy Crush, which are addictive for adults, never mind kids? How about providing links to helpful websites like Fundamentally Children so parents can find apps to help their child’s learning rather than just kill time? If there was some easily accessible, up-to-date guidance, more children could be reaping the benefits of tablet technology right now. Instead, we are seeing an arbitrary, one-size-fits-all model to control ‘screen time’. Parents need guidance in how to help their children interact positively with something they may not really understand themselves – the iPad has only been around since 2010. There simply isn’t any long-term research into the various effects technology usage has on the development of children. One thing is certain, however – tech is here to stay, and the adults today’s children will become will live in a world utterly entwined with it. The problem is real, but the causes of and solutions to it require guidance rooted in solid research into appropriate content, and an understanding of parents’ different technical capabilities. By educating them about the huge potential offered by technology for learning, as well as the risks, we can help them achieve a balanced diet of usage, to keep their children intellectually nourished as well as entertained. For suggestions on some organisations we think are doing a better job advising parents and providing resources to schools, see our Resources page. But her preferred approach is one that extols the benefits of iPads for young children. But if there’s a paucity of research, how would an approach that told parents, “here are great way to use iPads” be any more research-based? The author may not agree with her school’s approach but her claims to have research on her side are specious. There’s no research showing iPads are beneficial for 2-year-olds.